Just pickked this baby up. It’s. 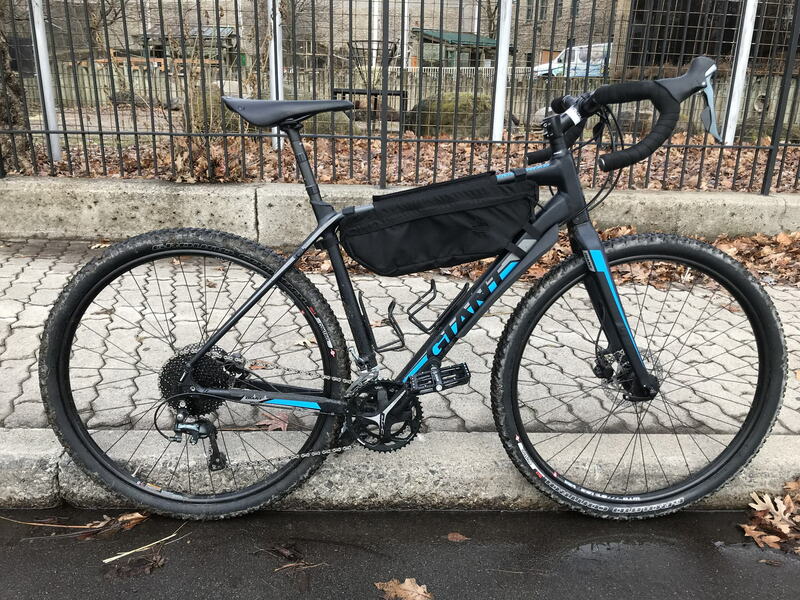 2018 Giant Toughroad SLR GX 0. Cant wait to ride it! Anyone else riding any of the drop bar toughroads? If so how ya like them? Nice. This bike is what the Revolt should have been just carbon. Tons of tire clearance and none of that mechanical to hydro braking nonsense. They look really nice! Congratulations! What sort of deal did you get on it? I have a GX1 and they are great bikes, very stable and versatile. I preferred the tiagra groupset to the SRAM and I don't think the semi hydraulic system is all that bad, honestly quite like it. It feels responsive and it's pretty easy to service. Not to mention I fell in love with the blue the GX1 came in! I got it for $1273.00 including tax! They gave me 30% off. I was debating between this and the one you got. But decision became easy when I found out they did not have yours in my size. I actually got the last one in the company in my size. How is the frame for compliance? This is one of the bikes I am considering but was wondering about any harshness due to the aluminum frame. just based on my only 2 hour ride today it felt great. With the tires being tubeless and running lower pressure it felt extremely comfortable. I have test ridden a Kona Jake the Snake with 40c tires and found it a bit harsh so was wondering about this bike. Last edited by D-Fuzz; 01-26-19 at 03:57 PM. I have test rode a Kona Jake the Snake with 40c tires and found it a bit harsh so was wondering about this bike. In my experience the tires/pressure make the biggest difference in comfort. Since this bike is setup tubeless out of the box you can run lower pressure to tame any harshness. Not sure if the Kona u tested had tubeless or not. The Toughroad can even take tires up to 50mm. I like the look of this bike and those are awesome pedals. Yeah I love these pedals! I never find the ride harsh, in my opinion, the frame of this bike is very stiff. But the carbon seat post really helps to negate this. Along with lower tyre pressure as others have said. Even when I'm just cycling to work and have the tyres at max pressure on the road, I find this to be a very comfortable bike. Yeah excellent choice and very good value for the money! The gearing, brakes and the wheels are all undoubtedly better on the GX0 so you made the right choice. I just really wanted a double chainset on mine. It is great fun to ride, I get excited every day when I'm about to take it out. I was just taking a look at the 2019 model and marveled at how dialed and well thought out the proportional geometry is. It's a fantastic value at $1400. Far more competitive in price compared to the specialized diverge line. 1. the diverge alu model only allows up to 38mm tires (just barely, maybe); the giant comes stock with 40mm and you can probably go wider. 2. the d-fuse seat post is one of the most underrated component specs in the industry. I've tried one and the additional flex allows for a noticeable improvement in comfort but is quite unobtrusive in operation. 3. I suspect I'd like the 44cm wide handlebar. This is a bit wider than normal for a medium sized bike. One question: what is the rationale for the super short head tube? 125 mm in a medium. I don't think a super aero position is necessary for a gravel bike, where stability is more important than getting the most aero position. The super short head tube isn't like that to make the geometry aero, it's more of a way to keep the bike proportionate given the very deep fork clearance, which allows for up to 50mm tyres on a 700c rim. The bike would result in a very upright riding position if the head tube hadn't been shortened down like this. I don't have any problems with the 440mm handlebar on my M/L sized frame, I find it very comfortable and not too aggressive but this is my first drop bar bike. Although I am considering moving down to a 420mm Easton EA70 bar in the future when funds allow. I agree that the D-fuse post is underated, I was at first sceptical of how much comfort it would bring to the ride, but it is excellent and works so well! Thanks @RicePudding . Makes perfect sense. Oddly enough I don't have a single objection with the 2019 drop bar tough road. I could nitpick about the color but it's subtle and understated and won't seem outdated in a few years' time. I'd like to see some sort of suspension for the front end but that's easily solved with a redshift suspension stem. It all comes down to the test ride and usually I get along well with specialized geometry rather than giant. Maybe this go 'round will be different. I sure hope so: that $1400 price point is exceptionally competitive. Specialized Diverge: the omission of rack mounts is perplexing. I can workaround it, but there's no penalty for including them, so why not? Future Shock is probably great, but it's $600 more although this moves you up to 105 and future shock. Add at least another $500 for suspension seat post and hydraulic brakes. I'm pretty sure I'll like the specialized geometry but I'm hoping I really like how the Giant rides. To get the specialized configured the way I want is double the price (hydraulic brakes, suspension seat post, new brifters). Last edited by radroad; 02-06-19 at 02:04 AM. I haven't really looked into the Checkpoint so I can't comment on the isospeed technology. The Specialzed Diverge is pretty univerversally acclaimed as an excellent gravel bike and many would choose this. I did look into this before my TR GX but like you pointed out, you pay quite a premium for it to be inline with the Giant. There are a few little quirks that make the Diverge better than the TR GX. It uses thru axles rather than QRs. Full internal cable routing, racier CX geometry. But one of my main gripes was the mechanical disc brakes and I really like the carbon seat post and a few of the other little perks of the TR GX like the integrated handlebar mounts. Also, I have seen some criticism about the future shock system. I have not had direct experience with it but I know some don't think its all that great. The Canyon Grail looks like an amazing bike, it's very original with the "double decker" bar which I'm sure will add a ton on compliance but that's only on the higher end spec'ed bikes. One of the things that I find a bit annoying about these is that they opted to use press fit bottom brackets on Aluminium frames which just seems a bit silly, I understand the need to use them on carbon but I'd always prefer threaded on a metal frame. And yes, they are a fair bit more expensive but if you have the money, the Grail looks excellent. 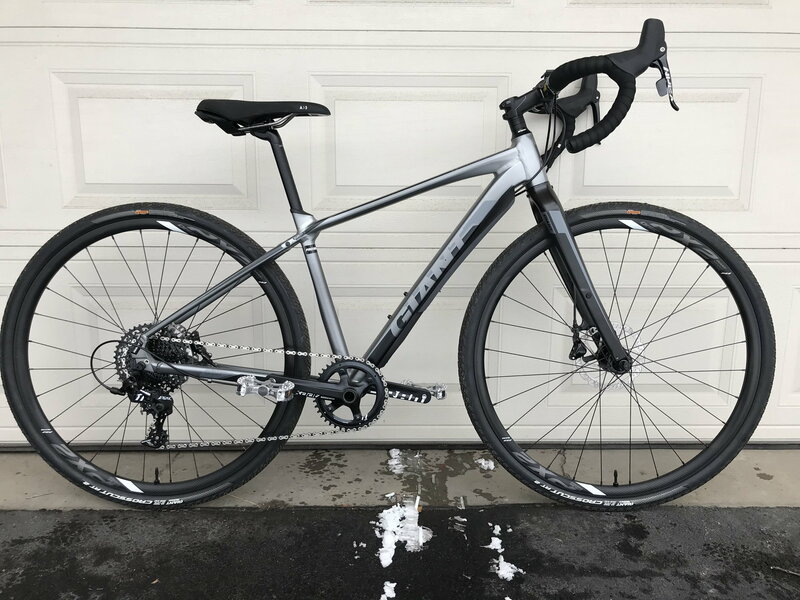 The Cannondale dilemma is annoying, I'm like that with most of the Giant bikes, hence needing a M/L, they don't offer this size for all of their bikes though. I'd be careful if you go for the Cannondale as you want to make sure your fit is right or you might wish you went for the other size post purchase. Isospeed decoupler imo changes the feel very little, near negligible. Slightly more flex is all it allows. Glad to see you enjoying your Toughroad. I got mine a little over 6 months ago and have enjoyed riding it and seeing what it can handle. I got the GX1 model and I changed a few things from stock including the stem, seat and seatpost (the og seatpost was creaking a lot), gearing, as well as setting up a separate wheelset for more off-road oriented riding. I also changed the bars but I changed them back recently for other reasons. Just out of interest, what seat post did you switch out for? I really like the stock carbon one, though mine creaked a bit just after putting on some paste, but it's quietened down now. I was just curious because I didn't think you could change the post for anything but Giant's D-fuse alloy variant. What rims do you have for your second set? I'm still looking for a second set for off road rides but can't decide what I want my budget to be, I'm still going to be running my semi-slick profile set 90% of the time. 50mm is still very generous for a gravel bike. I replaced the stock seatpost for a zero offset d-fuse seatpost. I actually like it because at my weight I was getting quite a bit of flex from the stock d-fuse post. I did want to get an alloy d-fuse post but those are impossible to find outside of the lowest end Toughroad model. 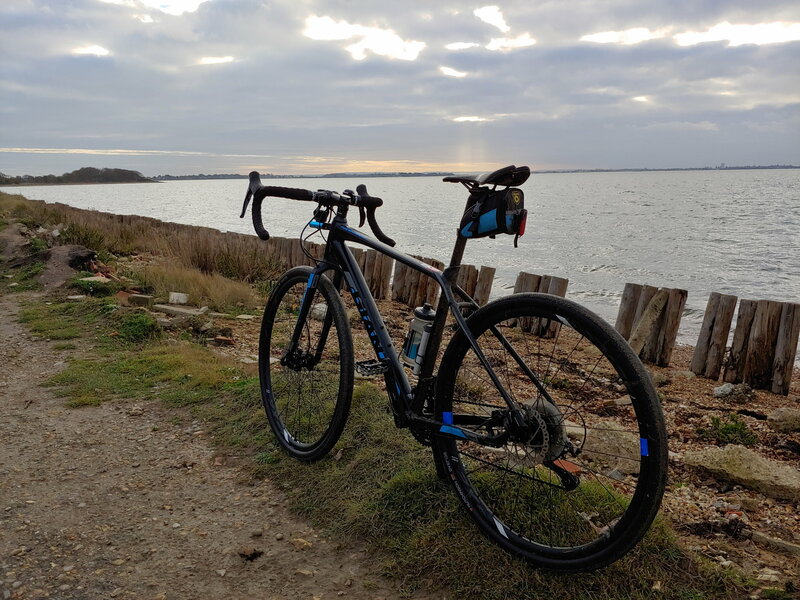 Im running a pair of WTB i23s as my second wheelset as I had them prior to buying this bike, however when I got the Toughroad and found the stock wheels were set up tubeless I decided to do the same with these. They’re an inexpensive wheelset and I’m currently running them sort of as my winter wheelset. I currently ride the Giant Escape as a daily commuter and short tours on the weekends. Thinking of getting the Toughroad for longer tours this Summer. Looks pretty sweet. I have a GX1, have about 1200 miles on it, even rode it in a century last summer. It’s been a great bike. I have the TR GX-0. Love this bike. 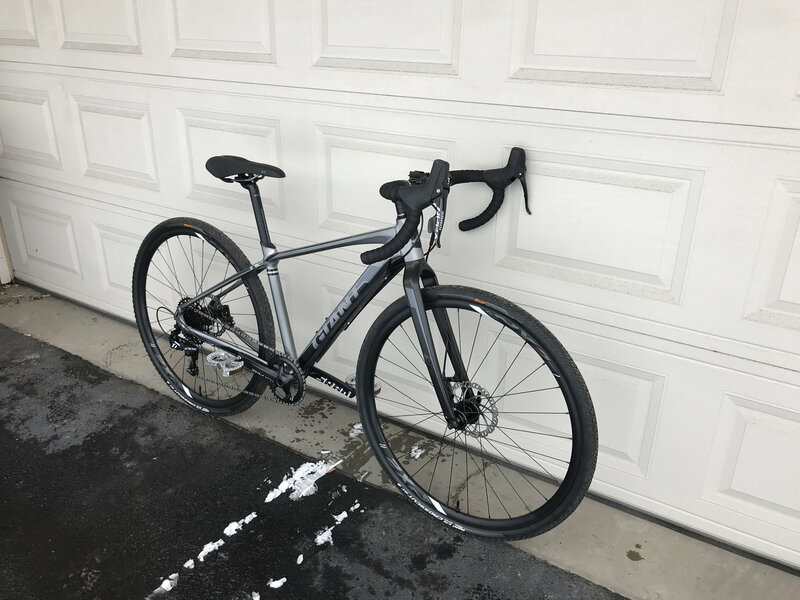 The ride is great bombed down a bunch of ruff gravel roads very stable and between the defuse seat post and carbon fork really don’t need suspension.